This has to be the most spectacular villa I have ever seen so far, of all the magnificent works out there, A-Cero outdid themselves with this beautiful project. I think I am over excited posting this, but I couldn’t help my enthusiasm, I am actually calling it my dream home. This residence belongs to none other than Spanish architect Joaquin Torres himself, and is located in La Finca, a residential area near Madrid, Spain with a total area of ​​1700m2. It has two levels, ground floor and first floor.All the rooms are decorated with items designed by A-cero, alternating with classic designs, antiques and works of art. The house is accessed from the outside by a door 5 meters high, flanked by two wooden blinds in the center, a rim of Jerez well, dating from the seventeenth century of Marita Segovia, handmade carpets from Turkey, orange-white and black picture of Mercedes Rodriguez Parrizas. On the right pedestal, So-fha sculpture from the Thailand gallery of Antonio Martin. The decorations in the home are in an open dialogue between classic and contemporary. The living room window of 15 meters, lies on the floor automatically, leaving open to the terrace. A-cero designed the sofas, executed by Manama, upholstered in white silk. Coffee tables design by A-cero, made ​​by Herranz Brothers in DM with high gloss and white lacquered sheet steel for the inside. Two Mies Daybed, Barcelona model in white. India silk white carpet of Naim. The kitchen is also designed by A-cero, executed by Aries kitchens in high gloss lacquered with DM in white, gray and countertops of graphite and gray Corian . A large central island of white Corian, which ends in a flight of 5 meters serving as a dining area /office. Appliances are from Siemen. On their blog, A-Cero describe the details and the process of the works on this beautiful work of art. You can check photos as well of the work process. Architectural icon after the other, A-Cero never refrain from keeping us in awe with the amazing sculptural designs they present. I am really impressed recently with Spanish designers and their works. The design impact of this Open Box House, as they named it, can not be missed, the open spaces, the minimal use of colors yet strong volumes are what characterized it. 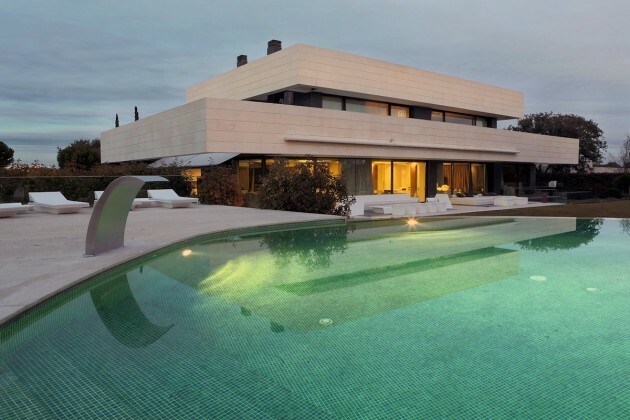 The residence is located on the outskirts of Madrid, Spain and the design is inspired by Spanish sculptor Jorge Oteiza. The interior spaces are overlapping and overlooking each other. A large mirrored partition serves as a background for a long fireplace, a glass bridge hangs over the living area and is adjacent to a large bookcase. Natural light is plenty, tiles used are large grey ceramic tiles, furniture used is mainly from Fendi Casa. In the photo above you can see the Elisa chairs by Fendi Casa and the Canova console in black lacquer finish. The sofa is called Domino, also by Fendi Casa.